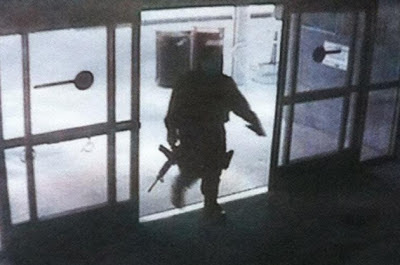 Santa Monica College's gunman has been identified as 23-year-old John Zawahri, a former student at the college. Police said he had prepared with an arsenal of weapons and ammunition. This is his high school photo. Source. Zawahri enters Santa Monica College. 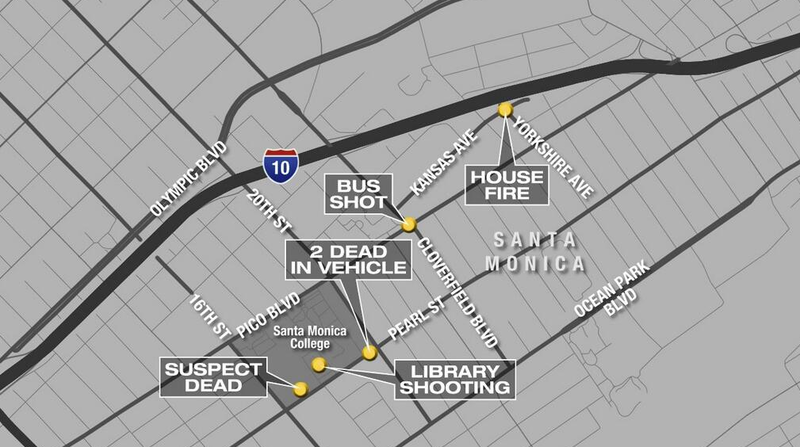 The shooting suspect first killed his father and brother before moving on to engage in random shootings on his way to Santa Monica College's library to have his own life ended in a "suicide by cop" exchange. A man dressed in black walked onto the Santa Monica College campus, dressed all in black and paramilitary, with an assault weapon. Several shots were fired at women, at passing cars, and at a bus near campus. Reportedly two people were killed, also near campus, in a house that was set on fire. 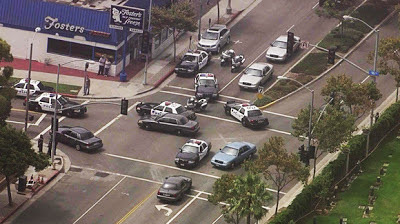 Santa Monica Police Chief Jacqueline Seabrooks said the shooter was killed on the campus of Santa Monica College after attempting to evade police responding to multiple shootings that began about a mile from the school. Seabrooks said that two people were dead in a home in Yorkshire Avenue that was ablaze about a mile from campus. Another person died on Cloverfield Boulevard, and two were killed on 19th and Pearl streets. Another woman later died in the hospital, Seabrooks said. The dead body of the suspect, who looked like he was a SWAT member, was seen by several eyewitnesses in the campus library. At midnight, on Friday, police revised the number of people killed in the shooting rampage in Santa Monica, California, to four deaths plus one dead gunman. 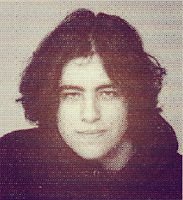 All the victims were from shots of a lone gunman. The next day, another victim died. Five dead, plus the gunman. Six dead, in total. 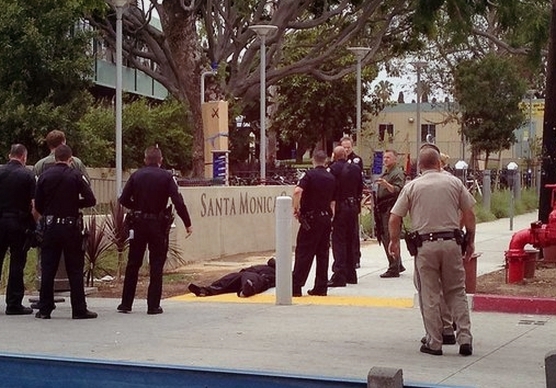 The gunman died on the campus of Santa Monica College after being shot by police. Sgt. 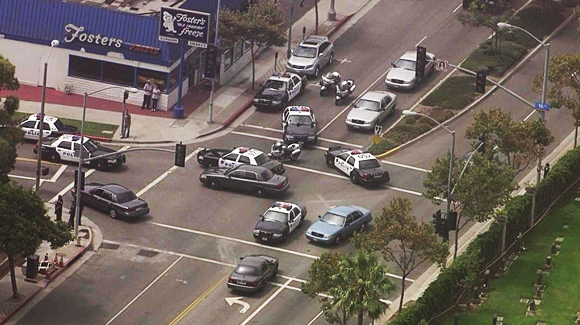 Richard Lewis of the Santa Monica Police Department added that five people were injured, one is in critical condition and one is in serious but stable condition. One witness to the shooting who was not identified told a local CNN affiliate that he saw a man drive up in a car, walk into the middle of an intersection with a gun and open fire at passing vehicles and a building before "he jumped back in the car and took off." "It seemed like he was alone in his car," the witness said, recounting that he took cover under the dashboard of his own car, which was struck by gunfire. "I saw him jumping out of the car. 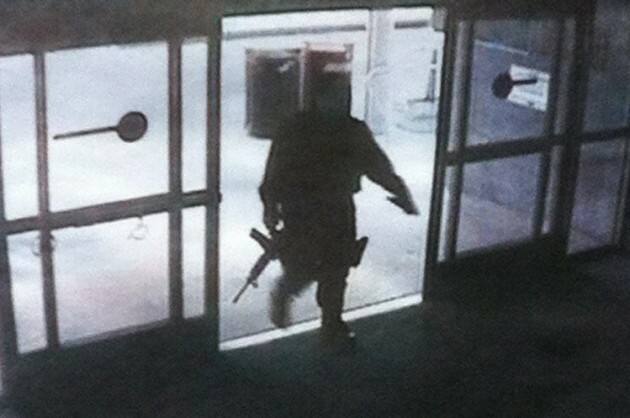 He had a big, black gun in his hand and he just started blasting maybe 10 rounds from the left to the right." Obama was attending a fundraising event at the Santa Monica home of former News Corp President Peter Chernin at about the time of the shooting and had just finished his remarks, but he made no mention of the incident. 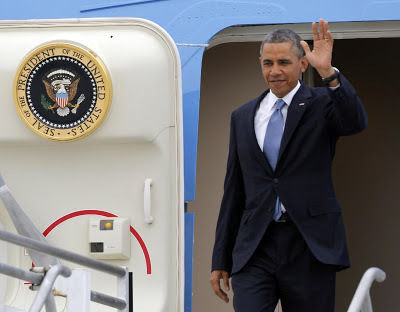 A Secret Service spokesman in Washington said: "We are aware of the incident and it is not impacting the visit. It's a local police matter at this point." 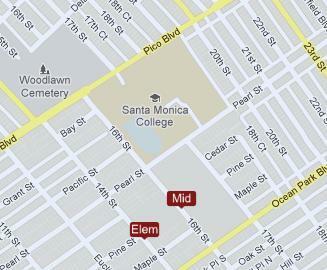 Santa Monica College also had a gunfire incident on that campus on August 16, 2011. A 5th victim passed away today, putting the total of lives lost at 6. This happened on 6/7/13. 6 victims in June (6), on the 7th. Some say that their lives are all 6's and 7's, a battle between good and evil. 666 obviously represents the devil, and 7 represents mankind because it was on the 7th day when God completed Earth. All 6"s and 7's. There were a lot of bigwigs in LA at the time. Reason enough for a blood sacrifice in honor of all the important guests. Police Chief Charlie Beck said about 1,800 people from 60 major cities attended the conference and most watched the demonstration. Representatives from the United Kingdom, New Zealand, Australia and Canada also attended. 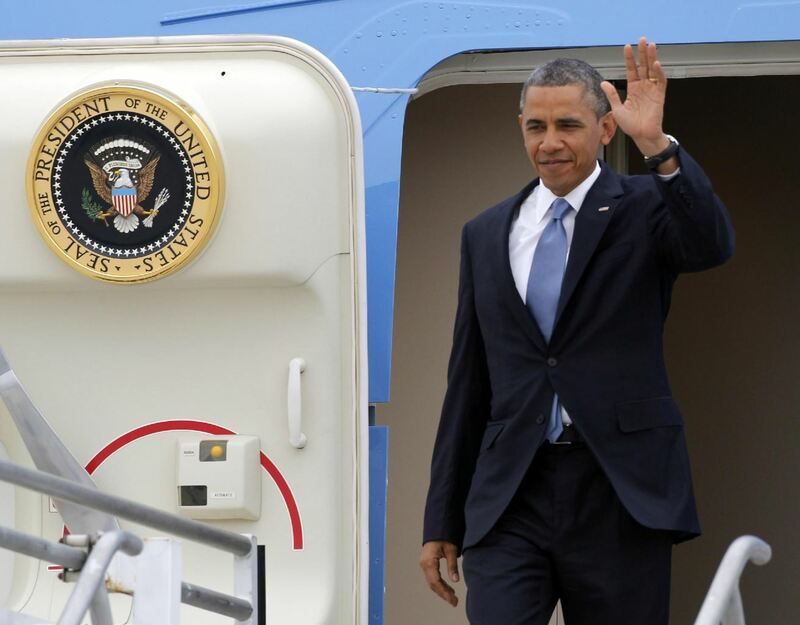 Air Force One landed at Palm Springs International Airport about 3:15 p.m., roughly 25 minutes behind schedule after a shooting in Santa Monica that [b]delayed[/b] Obama’s departure from Los Angeles. Coria was a campus resource officer teaching a seminar on bullying and reporting threats in 2006 when she first took notice of Zawahri sitting at the back of a classroom.